Team H20 Spray is pleased to offer a comprehensive service for commercial building washing in Toledo, Ohio and the surrounding areas. Our service is designed to be effective, prompt, and completely hassle-free - so you can enjoy the incredible results of our cleaning in the most efficient possible timeframe. Commercial buildings tend to be located in built-up areas, which means they are exposed to a huge amount of pollution, dirt, and debris. Over time, grime can accumulate to the point where the aesthetics of the property are impacted. A dirty building will create a poor first impression for your customers, and may even negatively impact the way that your business is perceived. Cleaning a commercial building is incredibly time-consuming, so few business owners have the available time to do it for themselves. A sparkly-clean building ensures that your customers are not distracted by dirt and grime, leaving them free to focus on the products or services that you provide. With dedicated commercial power washing, your premises will look smart, clean, and professional when they have been properly cleaned - exactly the image that you want to portray. Clean premises also ensure that you will be welcomed into the local community and afforded respect as a professional enterprise. Rather than attempting to clean the property either by yourself or with the help of staff, you can leave the cleaning in the hands of the professionals; we’ll do what we’re good at, so you’re free to do what you’re good at! Our service can be completely tailored to meet your business’ individual needs - there’s no property too big, too small, or too oddly shaped for Team H20 Spray’s service for commercial pressure washing in Toledo OH! We use the very latest cleaning techniques, materials, and equipment in order to deliver the best results for our customers. When you hire Team H20 Spray, you can be sure you will benefit from the best possible commercial building washing service available. We are a family-run business, which provides us with the opportunity to put the customer at the core of everything we do. We pride ourselves on our ability to go above and beyond in order to achieve the best possible results; our work isn’t complete until you’re 100% satisfied. 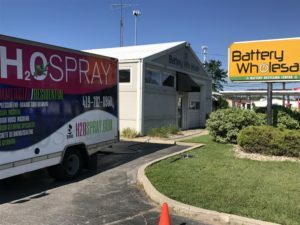 We have provided commercial building washing for companies across the region; in Toledo, OH and the surrounding areas, making us the convenient choice for all local companies. All of our work is fully insured, and is carried out by genuine experts who have honed their skills through years of experience - so you can be sure of a truly impressive result that is sure to impress both new and existing customers who visit your premises. We offer free estimates to all customers, so please do get in touch today to discuss your specific requirements in detail. We look forward to providing you with perfect service for commercial building washing in Toledo Ohio in the near future.